Gender data is increasingly seen as a tool to help realize the Sustainable Development Goals, including SDG #5: achieve gender equality and empower all women and girls. But demand for and use of gender data remains low worldwide. 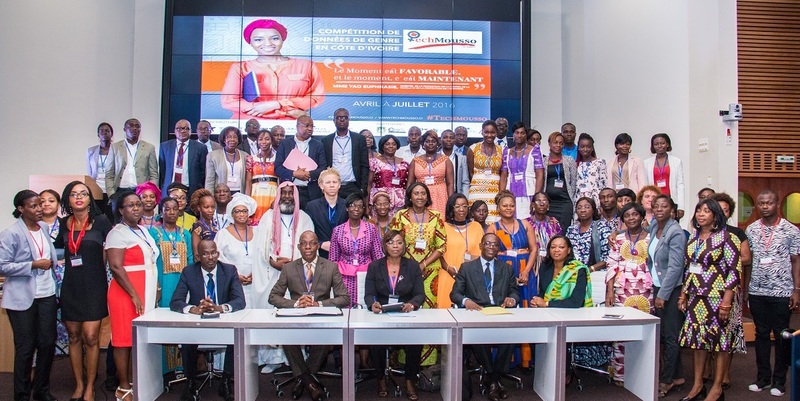 So last year in Abidjan, Côte d’Ivoire, we launched TechMousso, a first-of-its-kind open gender data competition, as part of MCC’s partnership with Data2X, an initiative hosted at the United Nations Foundation to improve the availability and use of gender data. Representatives from Côte d’Ivoire’s Access to Information Commission; National Institute of Statistics; Women’s Compendium; UNESCO Chair on Water, Women, and Decision-Making Power; and the World Wide Web Foundation (seated) meet with civil society representatives from across Côte d’Ivoire during the country’s first-ever gender data consultation workshop in Abidjan. TechMousso brought together the Ivorian tech and gender communities around data to develop solutions to local problems. It began with Côte d’Ivoire’s first-ever gender data consultation workshop, where more than 60 representatives from government and civil society helped to identify the community’s needs. The workshop was followed by a competition that generated proposals from about 80 teams, with 20 of those teams — each with at least one female competitor — developing their solutions. The 10 winning teams presented apps, web platforms and data tools designed to help the public and decision-makers generate and use gender data to improve women’s health, safety, education, and economic empowerment. First prize went to a team that devised an app that helps women schedule medical appointments during pregnancy, which allows maternity centers, hospitals, and health departments to better coordinate staff time and equipment such as hospital beds. Second prize went to a team that created web-connected jewelry that stores the wearer’s medical information. And the third place team designed a system for gathering data to map gender-based violence so it can be tracked across regions and communities. The winning teams shared cash award prizes totaling $25,000. #1: Keep your eye on the clock. TechMousso had a short competition timeline of four months. Future competitions should budget at least six months — three months for preparation and planning, and three months for the competition itself, including one month for teams to submit their proposals and two months for teams to prepare their final products. #2: Budget for expenses big and small. TechMousso was an ambitious and highly professional competition, and execution exceeded original budget estimates. In addition to major expenses such as event space and award prizes, it is important for competition organizers to account for the costs of marketing and critical needs like internet access for participants and teams. In total, organizers should expect to budget $250,000 for a competition similar in size and scope to TechMousso. #3: Empower locals to lead. The TechMousso competition was designed to respond to the needs of the Ivoirian community. By holding a gender data consultation workshop to define competition themes, and asking participants for proposals based on those themes, the competition captured problems and offered solutions driven by Ivoirians. #4: Prep for partnerships. The participation of government, international non-profit, and local private sector and non-profit partners led to greater integration with local tech and gender communities; but it also presented operational challenges. For example, working in multiple languages and across countries and organizations required extra time for clearances. To address these challenges, competitions should define rules and regulations early on to avoid misunderstandings and delays. #5: Bring your A team. TechMousso’s success stemmed from a stellar Ivorian project implementation team — including Nnenna Nwakanma, one of Africa’s leading internet advocates — and the participation of prominent Ivoirian bloggers, respected judges recruited from partner organizations, and skilled mentors. #6: Demand diversity. Requiring each competing team to have at least one female member ensured that women and girls contributed to and were integral in the solutions presented at TechMousso. It also gave female participants the opportunity to take full advantage of the training, networking and exposure the competition provided. #7: Take the long view. Aside from prize money, TechMousso was limited in its ability to support winning teams after the competition. To support competitors’ success, consider partnering with the government or private sector to continue advancing project development and bring solutions to scale. MCC, Data2X and the World Wide Web Foundation were proud to see the TechMousso competition generate excitement around gender data among participants, the tech and gender communities, and government decision-makers in Côte d’Ivoire. Several teams continue to work on their projects, and the Ivorian Government is exploring ways to integrate some of the solutions developed through the competition. We hope that other countries in the region will be inspired by TechMousso’s success and that more gender data competitions will follow. They have the power to inspire local solutions to local problems — they can help boost female participation in science, technology, engineering and math, and help fill persistent gaps in gender data around the world that inform new efforts toward gender equality. MCC remains committed to advancing the demand for and use of gender data, and making our gender data available and accessible to encourage data collaboration so we can turn the SDGs into reality.